Do you have a blog for your business? If so, you understand the struggle of coming up with a new topic each week. In fact, brainstorming a topic can sometimes take as long as writing the post itself. And sometimes, you might feel like throwing in the blogging towel. It doesn’t have to be this way. 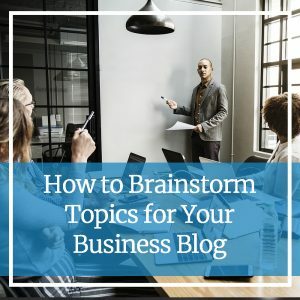 What if we told you that you could brainstorm enough blog topics for months to come in a short amount of time? It’s true! Read on to find out how. You have a 434% higher chance of being ranked highly on search engines if you feature a blog on your website. Businesses who use blogs as a part of their content marketing strategy get 67% more leads than businesses who don’t. It doesn’t matter what niche your business is in: you need a blog. You’re missing out on numerous leads and sacrificing your rank on Google by not having one. Don’t let the seemingly difficult process of brainstorming and writing your blog stop you. It’s easier than you think. Before you get started, make sure you have a way to keep track of your ideas. We recommend creating an Excel spreadsheet or Google Doc where you can store and reference your ideas on an ongoing basis. Answer the Public: Answer the Public is a unique tool that allows you to enter a keyword and receive questions, prepositions, comparisons and more. The keyword “writing” generates questions such as “how writing leads to thinking” and prepositions such as “writing formal emails.” You can make blog topics from these results quickly. Quora: Quora is a question and answer platform where users can ask questions and answer questions for others. By doing a quick search of a keyword, you can see what your potential audience is asking and create blog topics from these queries. These resources will help get your creative juices flowing, giving you a solid foundation to build on. Your blog content is written for your customer. So, it makes sense to simply give them what they want and need. Log into your social media accounts and see what questions your customers are asking in your comments, tweets or messages. Create blog ideas based on their concerns and queries. Or, send your email list a quick survey asking what kind of content they would love to see. Do you record a podcast for your business? Do you offer lead magnets on your website for your customers? Do you speak publicly? Do you attend networking meetings? You can generate blog ideas just from simply repurposing the content you already have! Take each podcast episode and go deeper on a single topic you discussed. Did you cover several topics in one episode? Each topic gets its own post! Take a lead magnet, break it down into sections and create blog posts on each section. In either situation, you can then link your lead magnet or podcast to your blog, generating traffic to both. What are other businesses in your niche writing about? Review their topics to generate new ideas of your own. WARNING: Whatever you do, don’t copy! Instead, use their ideas as inspiration. Better yet, read the comments on their posts or see how folks commented and shared the posts on social media. Take note of how their customers are reacting and generate ideas from what works well and what doesn’t. Why Do You Need a Business Blog? How Do You Create a Business Blog? Now, take the other topics you’ve generated in your spreadsheet and do it all over again! Soon, you’ll have enough blog topics to keep you busy for months to come. Still stumped? We get it—words are hard. But, we’re here to help! For blog topic brainstorming and blog writing that fits your business and your voice, reach out to us today by calling 612-643-1824 or send us a message!